It really was an awesome show of determination and courage on the part of the Venezuelan people; defeat the criminal coup plotters and their puppet master, and reinstate Venezuela's legitimate leader. 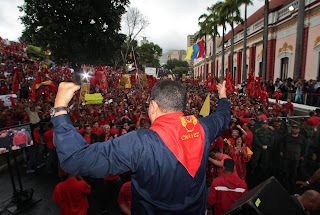 That day,through that heroic deed they, the Venezuelan people, saved the Bolivarian Revolution, and made clear to the world, but above all to the imperial power, what power of the people and democracy means. But people of Venezuela, remain vigilant, because the counter revolutionaries forces are lurking around. LONG LIVE THE BOLIVARIAN REVOLUTION!! Um exemplo tão raro hoje, na America Latina, de jornalista que tem a coragem de enfrentar a hipocrisia ao invés de se vender para interesses empresariais que se afastam do povo. O os brasileiros que sonham com uma america latina mais unida e desenvolvida, sem miseria, te agradecem! Hopefully, such a coup will never happen again. But if evil should manage to slip through the cracks again, and is once more defeated, President Chavez should take off his gloves and kick anyone who conspired against Venezuela out for good. If these opposition groups have more loyalty to a foreign government, then they should be relieved of all authority and kicked out of Venezuela, never to return. The next time they go to Miami for their miserable conferences, they can just buy a one- way ticket. Venezuela does not need traiors and saboteurs.